This truly is the perfect little summer dress. 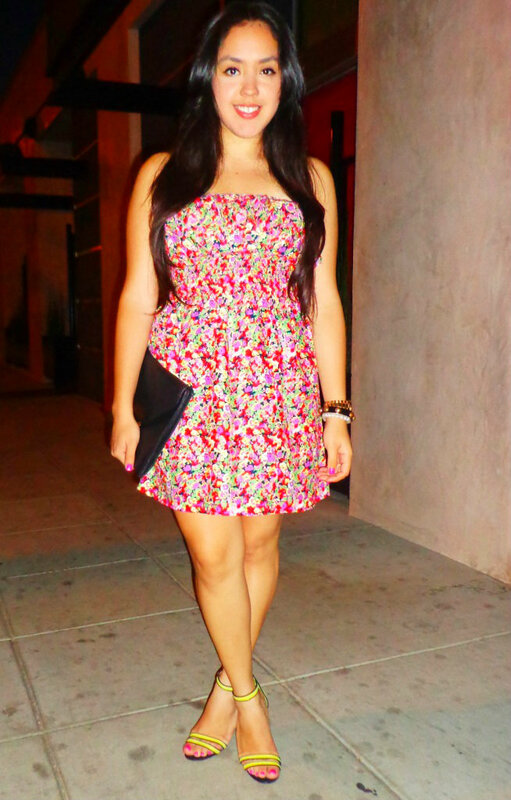 Its floral print with bright colors, flowy, and accentuates the waist. I wore it for a birthday party I attended last night. And it is definitely a must-have piece in my closet. Have a wonderful Sunday! Today I was forced to ditch my heels for some sandals. I had a lot of errands to run so I had to be comfortable! I went for a super casual look but I think it still looks summery and feminine. I was able to take a couple of quick pictures while taking my baby out for a walk. Hope you like them! Last night, while looking through my closet, trying to come up with today's outfit, I came across this top that I hadn't come around to wearing. While I was at it, why not incorporate another new-old piece? When I first saw these pumps, I was immediately drawn to the pink soles. I hope to one day be able to afford a pair of red soles, but the pink ones will do for now. I'm loving the slingback, and did I mention the pink sole? When in doubt of what to wear, wear a dress. Today was one of those days, so I decided to bring out this olive colored dress. I really like the color and its simplicity. Maybe its just the color, the buttons, or the uniformed look, but doesn't this dress remind you of the Army? I've done it again: Abandoned all my other babies, and planned all my outfits around these new ones. Even after I had promised myself I wasn't going to wear them again at least for another week. Oh well, they make this outfit look good! Enough about my wedges, I wanted to go for a simple and casual look today. I planned this outfit around this leopard printed belt with a bow in the middle. The bow makes it super girly but the leopard print adds some edge to any ensemble. I wore a plain rose colored top with a really nice ruffle detail at the back. I really like this top, but I just hate how it gets wrinkled so easily! You can clearly see it in the pictures. I hope you like this look and thanks for stopping by! Color-blocking with bright colors can be a bit intimidating. If you find it to be a quite dramatic transition, you can start with pastel colors and then move on from there. Its suggested to stick to two colors but I decided to go for three! I could have gone with your typical black pumps for a more uniformed and "safe" look, but I decided to go with my neon yellow sandals. All three colors are so bright and vibrant, I just love how they look together! 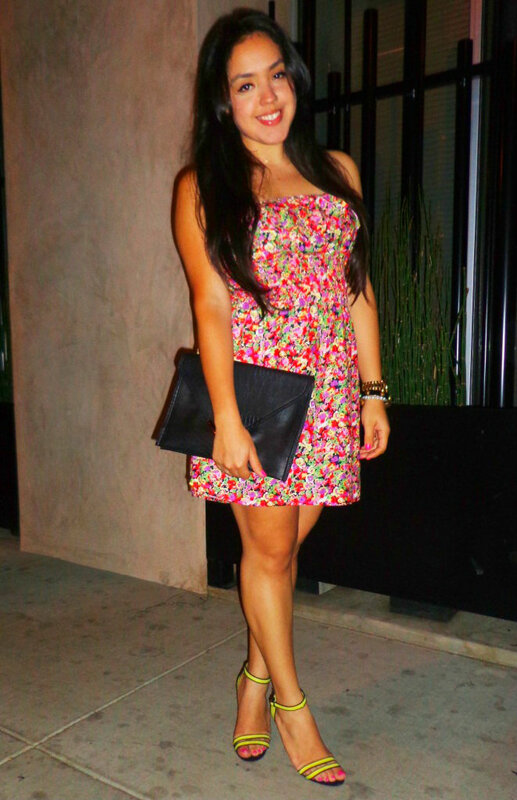 I wore a printed clutch to add some texture and kept it light on the accessories. Lately, my posts have mainly consisted of Neon and Floral. I'm sorry if I've bored you with this, but I just can't help it! I especially love the contrast it makes in this outfit. Since the top is neon yellow and the skirt consists of mainly blue, I guess its even considered color-blocking. This outfit was perfect for today, it was hot, but a bit windy, so my skirt would flow and I felt like such a goddess! Hey loves! I hope you're all having a wonderful weekend! This is the outfit I wore today. The heat has been crazy here in LA so I opted for a breezy top and short shorts. I'm actually wearing this top for the bi-weekly challenge, which was to wear stripes. The loose fit makes it an essential in my summer wardrobe. And I love how it looks with the neon shorts. They're brighter than they look, trust me. I decided to pair this with my new H&M wedges. They're suede material and have a really low heel so they're extremely comfortable. Summer is in full effect, and this outfit is perfect for those hot Cali summer days. Floral print is always in this time of year, so you can practically pair it with anything. I went with a basic blue button-up top and wedges for a casual look. Since its been really hot these last couple of days, I braided my hair. You can see in my previous post that its been a little crazy and all over the place. I just can't bear the thought of straightening it in this hot weather, I just want to have it up in a bun ALL the time! How do you deal with your hair in this crazy summer heat?